SAP (Systems Applications and Products) has many build in functions that displays pop-up dialog screens. WS_MSG - Create a dialog box in which you display an one-line message. POPUP_TO_CONFIRM_STEP - Create a dialog box in which you make a question whether the user wishes to perform the step. POPUP_TO_CONFIRM_WITH_MESSAGE - Create a dialog box in which you inform the user about a specific decision point during an action. POPUP_TO_CONFIRM_WITH_VALUE - Create a dialog box in which you make a question whether the user wishes to perform a processing step with a particular object. POPUP_TO_DECIDE_WITH_MESSAGE - Create a dialog box in which you inform the user about a specific decision point via a diagnosis text. POPUP_TO_DISPLAY_TEXT - Create a dialog box in which you display a two-line message. POPUP_WITH_TABLE_DISPLAY - Provide a display of a table for user to select one, with the value of the table line returned when selected. POPUP_TO_CONFIRM - Pop-up dialog confirm an action before it is carried out. POPUP_TO_INFORM - Displays several lines of text. No OK or Cancel buttons. TH_POPUP - Display a popup system message on a specific users screen. POPUP_TO_CONFIRM_LOSS_OF_DATA - Create a dialog box in which you make a question whether the user wishes to perform a processing step with loss of data. 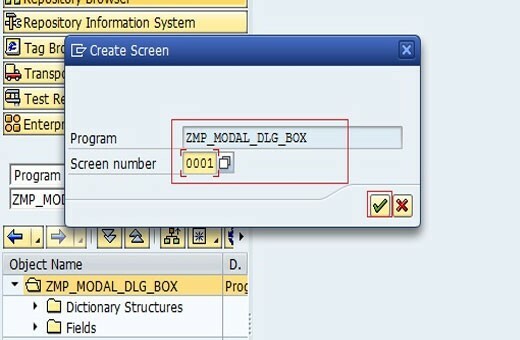 Please tell me how to create a popup window in module pool program it should accept table fields and there should be continue(symbol i.e tick mark).